You are at:Home»News»New Ships»Quantum of the Seas Sets Sail from NYC. Hurray! Quantum of the Seas Sets Sail from NYC. Hurray! Richard Fain, the Chairman and Chief Executive Officer at Royal Caribbean Cruises, explained that the launch was a culmination of a “journey which began in 2009.” According to Fain the line is committed to thinking outside of the box and back in 2009 decided that it was time to shake up the cruising industry with something extraordinary. “That was when we decided to start working on a new type of cruise ship for a new type of cruising. 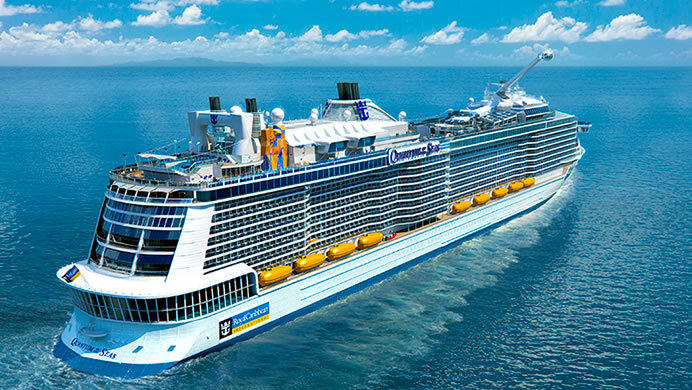 We thought, ‘how could we top Allure and Oasis of the Seas?” The result was the commissioning of Quantum of the Seas, a 4180 passenger mega liner featuring 18 decks, 168,666 tons worth of weight and a colossal price tag of US$935 million. In classic Royal Caribbean style the official launching ceremony took place in the constantly buzzing New York City – or New Jersey’s Cape Liberty port to be precise. The ship’s official Godmother was none other than iconic Emmy award winning actress Kristin Chenoweth. It was a lavish ceremony to say the least, with guests treated to an array of entertainment throughout the event. A unique ‘earth harp’ recital saw strings spread across the length of the vessel’s majestic theatre while Chenoweth graced guests with a performance of “Somewhere over the Rainbow.” You can watch Quantum of the Seas’s Godmother introduce the ship in this video: Royal Caribbean also embraced its dedication to multiculturalism with blessings from both a reverend and a rabbi. Needless to say Quantum will be a well watched over ship! While the line generally adopts a strategy of keeping its vessels one third traditional, one third evolutionary and one third revolutionary, Fain maintained that Quantum admittedly boasts an extra element of revolutionary. And when you look at the on-board features and facilities it’s not hard to see why! Passengers enjoy access to all kinds of at-sea innovations including robotic bartenders, a RipCord by iFly skydiving simulator, FlowRider surfing machine, SeaPlex active space, radical Two70° venue and NorthStar observation arm. Not to mention lighting fast Wi-Fi access, exceptional service and well-appointed accommodation options offering passengers everything from compact budget friendly cabins to opulent multi-level suites. “We wanted people to say, ‘Do you remember cruising before Quantum?’, the same way that they say, ‘Do you remember payphones, or using fold-up maps before Google came along?’” explain Fain. Image sourced via Royal Caribbean Press Center. Credit: Royal Caribbean.